Dan Micciche has no plans to bring in any more attacking options on transfer deadline day. 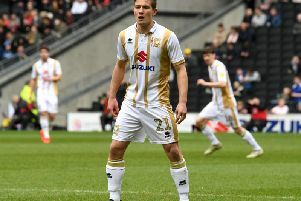 Having added defenders Josh Tymon and Elliott Ward on Tuesday, Micciche confirmed he was happy with the squad's attacking options, despite only scoring 29 goals this season. But with the transfer window closing at 11pm tonight (Wednesday), the Dons boss said make exceptions if the right deal came along. "I'm not expecting to, but if comes in which we have to really look at we will do," he admitted. "We're not completely closing the door. "Our priorities were to cover for Joe Walsh and Scott Golbourne. I'm pleased with our attacking options - we've got Kieran (Agard), Osman (Sow), Chuks (Aneke), Ike (Ugbo), Sam Nombe and Giorgio Rasulo too so we've got options. I don't think it's a priority area. "I know people will look at the goals tally and think we need a striker but I think we need to coach them into better areas of the pitch, do our work on the grass. We will continue working with what we've got because I believe in them. "In other areas of the pitch, we're covered well. I'm not desperate to bolster anywhere else." While Micciche said there probably wouldn't be any further incomings, he said some of his younger squad players may be sent out on loan to gain first team experience. He said: "We may send a few of the younger lads out on loan, and it's important we develop their careers. If we want them prepared for the first team, it's important we send them out so we may do that.